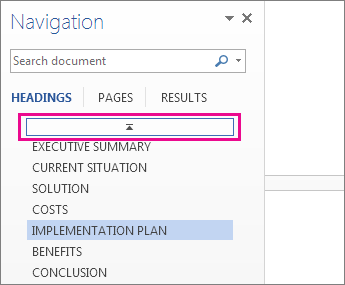 To go to a page or a heading in a Word document without scrolling, use the Navigation pane. To open the Navigation pane, press Ctrl+F, or click View > Navigation Pane. If you’ve applied heading styles to the headings in the body of your document, those headings appear in the Navigation pane. The Navigation pane doesn’t display headings that are in tables, text boxes, or headers or footers. In the Navigation pane, click the Headings tab. 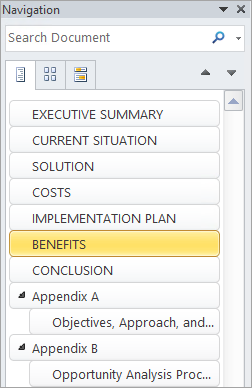 To go to a heading in your document, click that heading in the Navigation pane. Tip: To show or hide the subheadings under a heading, click the arrow next to the heading. 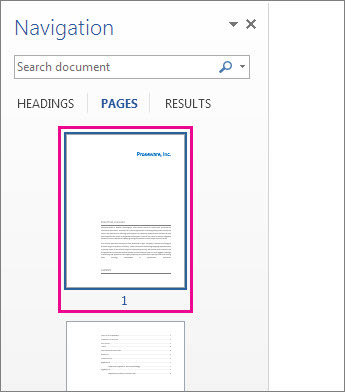 If you scroll through your document, Word highlights the heading in the Navigation pane to show you where you are. To go back to the top, click Jump to the beginning. Click Pages. Then click a thumbnail image to go to that page. When you do scroll through your document, Word highlights the page you’re on in the Navigation pane to show you where you are. In the search box at the top of the Navigation pane, type the text that you want to find. Click a result to see it in your document, or browse through all the results by clicking the up and down arrows. You can move parts of your document around by moving them in the Navigation pane. You can also change the level of headings, and you can add new headings. To move part of the document, click the heading and drag it to a new location. To change the heading's level or add a heading, right-click the heading, and then choose the action you want. Note: If a document contains regions that are protected, you might be unable to drag a section beyond the last protected region. In the Navigation pane, click the Browse the headings in your document tab. 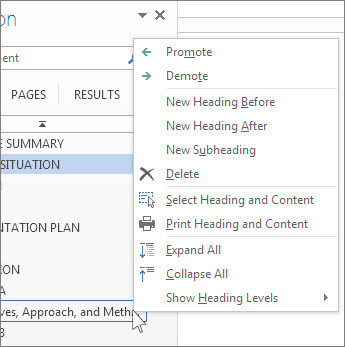 If you scroll through your document, Word highlights the heading in the Navigation pane to show you where you are. Click the Browse the pages in your document tab. Then click a thumbnail image to go to that page. Click a result to see it in your document, or browse through all the results by clicking the Next Search Result and Previous Search Result arrows. To change the heading to a higher or lower heading level, right-click the heading, and then click Promote or Demote. To add a heading, click New Heading Before or New Heading After. 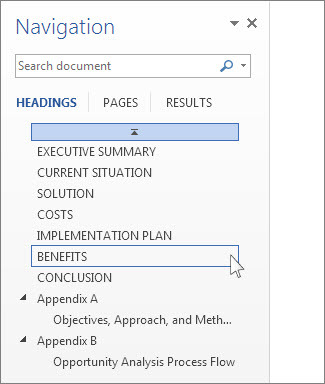 The Navigation pane in Word 2007 is called the Document Map. To open the Document Map, click View > Document Map. If you’ve applied heading styles to the headings in the body of your document, those headings appear in the Document Map. The Document Map doesn’t display headings that are in tables, text boxes, or headers or footers. In the Document Map, click the a heading to jump to that location in your document. Tip: To show or hide the subheadings under a heading, click the plus or minus sign next to the heading. 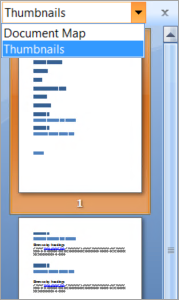 If you scroll through your document, Word highlights the heading in the Document Map to show you where you are. Click the arrow next to Document Map, and then click Thumbnails. Then click a thumbnail image to go to that page. 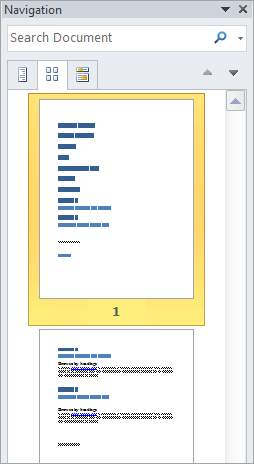 When you do scroll through your document, Word highlights the page you’re on in the Document Map to show you where you are.